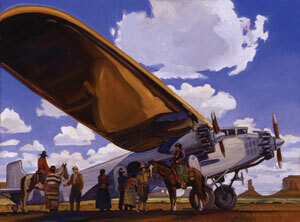 Dennis Ziemienski, Flying Buckaroo, Oil on Canvas, p42" x 48"
When Dennis Ziemienski talks about the imagery found in his new oil paintings, he refers to them as being about "the Old West after the Old West." For Ziemienski, this period of time is when railroads, vehicles, motels and rodeos started dominating the Western landscape at the beginning of the 10th century. "I like that period of time because it hasn't been well recorded," says Ziemienski. 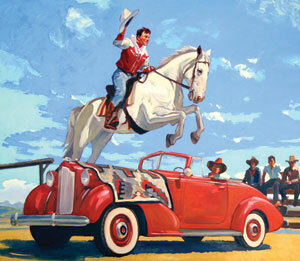 "You don't see a lot of paintings of cowboys sitting in Model T Fords, but they did and right alongside their horses. Roy Rogers had a television program that would show cowboys, Indians and horses but also jeeps, and his airplane the Sky King, so you really get those disparate items working together." Dennis Ziemienski, Desert Plunge, Oil on Canvas, 48" x 36"
The key to the paintings for Ziemienski, though, is understanding that the juxtaposition of cowboy life with the increasing influence of Modernism is not made up at all; the scenes actually happened and some of these technological advances were very much a part of Western life at this particular time period. "I did a painting of an airplane landing on the Navajo reservation set in the 1920s and 1930s and you see a lot of Navajo on horseback looking closely at the airplane," says Ziemienski. "It seems so incongruous but it did happen. You had spas and dude ranches in Arizona, California and New Mexico. It's the Old West after the Old West." 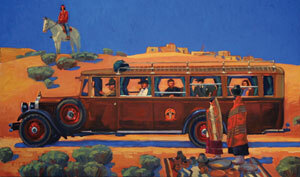 Dennis Ziemienski, Harvey Car, Oil on Canvas 24" x 40"
The spark for all of this came from Ziemienski's growing up in California during the 1950s and the scenes he would see while on vacations and driving trips with his family. Ziemienski finds that the appearance of this imagery coincides when people started to vacation out West. This led to movements like the opening of the El Tovar Hotel at the Grand Canyon in 1905. 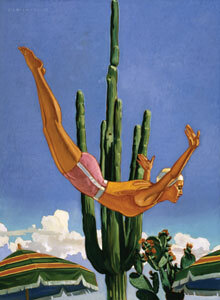 It also led to the creation of spas and dude ranches out West, which explains his imagery that contrasts a diving girl with a swim cap on against a cactus in the background. 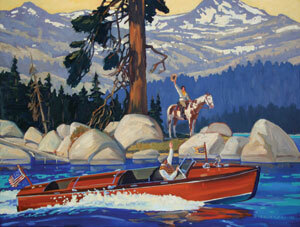 Dennis Ziemienski, Tahoe Boat, Oil on Canvas, 32" x 42"
"I was born in 1947 and growing up, living in California and taking car trips with my family allowed me to see a lot of this imagery but by the 60s and 70s I noticed that much of it was starting to fade away," says Ziemienski. "Old motels with neon signs, restaurants along the highway, some of the rodeos that were around, the state fairs, the Indians riding in pick-up trucks instead of horses. All of the things I witness then started to have me think that some day I would like to record those things, so now I am." 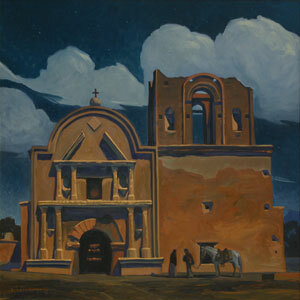 Dennis Ziemienski, Moonlight over Tumacacori, Oil on Canvas, 36" x 36"
Along with the power of these images, Ziemienski would like collectors to understand the sense of design and composition that goes into each work and the subtle abstract qualities that bring them together as paintings. Dennis Ziemienski, Arrival from the Canyon, Oil on Canvas, 36" x 48"
"When I paint the pictures with the imagery I choose, you want to have it up on your wall because you want to go there, want to go into the painting," says Ziemienski. "And that comes from the strong sense of design that I try and put in all of my paintings. It's the key to making a good picture along with subject matter, which is another important factor as well." 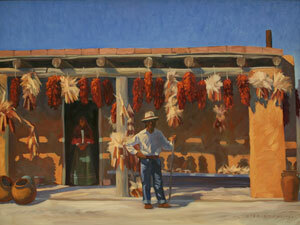 Dennis Ziemienski, Chiles and Corn, Oil on Canvas, 36" x 48"